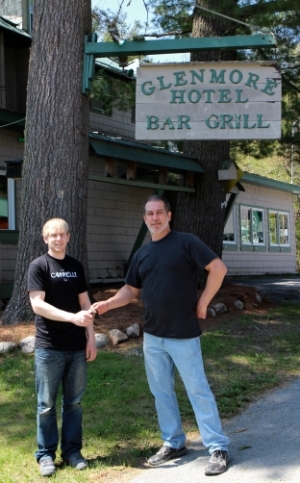 On Big Moose Lake, NY - Full Bar, Tavern & Restaurant, as well as, your lodging needs. Duffy's at the Glenmore is a casual comfortable place to enjoy the Adirondack experience with a nice relaxing atmosphere. Enjoy the views of Big Moose Lake from the bar or deck with a refreshing beverage or join us for dinner in the dining room or at the bar. Featuring both our tavern and dinner menu, we have something for every appetite. The Glenmore changed hands in June of 2015, as Robert Muller handed the keys off to Pat Duffy. Since taking over in 2015, Duffy has made several improvements to the structure, menu and overall feel of the Glenmore. Under the new ownership the Glenmore has landed itself back on the map as one of the many great restaurants in the Old Forge area. See our menu for the full story! The Glenmore is located on the west shore of Big Moose Lake. Take Big Moose Road up from Eagle Bay or down from Stillwater to Glenmore Road or take Trail #10 from Rondaxe Lake and the Old Forge Trail System.